Yuvraj Hans is the actor to watch out for in 2014. Let bygone's be bygones…but now, brace yourself for here it is - a new start, a new beginning, a new shot and a new action. Even though some people, some pieces of work, made every possible effort to make us laugh in 2013, we couldn't shed more than a tear! This year again, we are back, our armour ready and our shields safely tucked close to us. Punjabi film industry - bring on what you have! Comedy, suspense, action or your old tried and tested comedy, show us what you have and this time too, we promise to take it in our stride. 2013's setback to the genre of comedy has already sent an alert signal down the industry. Let's see what's in store in 2014. This year will also witness a good number of Punjabi film releases with a strong comic base. Amit Prasher, a strong believer in this genre, releases his Ishq Brandy on Feburary 21. The promo of the film has already been picked up by the YouTube most popular video section. Starring Roshan Prince, Alfaaz, Binnu Dhillon, BN Sharma, Japji Khera, Wamiqa Gabbi, Shivnder Mahal and Karamjit Anmol, this is the much-awaited comedy film in 2014. Others films that come with a promise to entertain you, not to forget the pledge to make you laugh, are Kshitij Chaudary's Asin Nai Sudharna, which was earlier called Mr and Mrs 420; Dil Vil Pyar Vyar that brings the talented singer of Punjab Gurdas Maan back on to the silver screen along with the promising actor-singer Jassi Gill, and Mundeyan Ton Bach Key Rahi that brings Roshan Prince and Jassi Gill together. That's not all; also lined up are Smeep Kang's Carry On Jatta 2, Rohit Jugraj's Jatt James Bond with Gippy Grewal in the lead; Double Di Trouble that brings Gippy and Dharmendra together and Navniat Singh's Rambo Ranjha. This year promises films that will make you think! Baljit Deo releases Himmat Singh that brings Bollywood actor Arjan Bajwa into Punjabi films. It is with this film that Punjabi actor Yaad Grewal is set to hit a solid punch. Amrik Gill-directed Kirpaan, releasing on February 7 and starring Roshan Prince, is a sought after movie of 2014. It talks about patriotism, of strength and valour. This year, the audiences are again looking at celebrated director Anurag Singh as he hits the scene with 1984 and Disco Singh, both starring Diljit Dosanjh in the lead. Hopefully, we will also see Diljit's dream project Mukhtiar Chaddha get a final shape and a go-ahead. Fateh and Patiala Dreamz, both expected to release in January, are two more films that will not clearly fall in the comedy genre. Yaar Anmulle 2 with Sarbjit Cheema and Dijlot Kaur along with others in the lead is another much-awaited sequel. Other Punjabi films that will release on their expected time if all goes well are Rangroot, Moga to Melbourne Via Chandigarh, Pendu Nai Dilan Dey Maadey, Control Bhaji Control, Desi Munde, Don't Worry Yaara…we still smell a lot of laughter! Almost half of the almost written-off people from Bollywood found their way into Punjabi films. This year the trend will only catch pace; Zarine Khan of Character Dhila song fame and Mehak Chahal of Bigg Boss fame will be seen in the Punjabi style films, along with others. Dhanveer Singh, a celebrated RJ, also comes back with a bang in the Punjabi film industry. Jassi Gill, a singer who has hit the popularity charts, is all set for back-to-back releases this year. Yuvraj Hans, not a debutant though, is one actor to look out for. Comedian actor Binnu Dhillon will be seen again, but more judiciously this year! Babbal Rai, the singer, also hits the scene this year. Satinder Satti, Diljot Kaur and Gurmeet Chaudhary are some more names that will be seen in Punjabi films. Enthralling the citizens of Ludhiana with the strains of her melodious voice and popularly known as the Nightingale of the Town, Neelam Khosla is an epitome of grace besides being a versatile vocalist and tabla player. A singer since childhood days, Neelam was very much influenced by her paternal grandfather, a known exponent of classical music. "I have played all kinds of musical instruments, the likes of which are found in museums today especially the tanpura," she says nostalgically. She continued singing in college functions and winning prizes even as a gidha dancer. Then being the typical quintessential Indian woman she got involved in domestic duties. As she looks back it was just a casual singing among friends and family but then her family realised her potential and urged her to take up formal training. Since then it is no looking back. Neelam started seriously dabbling in singing in the early nineties when she took up formal training under the tutelage of Pandit Chintamani for gayan and vadan, vocal and instrumental. "It was the need of the hour for vigorous riyaz under a formal guru is a must," she says on a serious note and one must go through this tradition of guru and shishya to inculcate discipline and get the true knowledge of music. It is like attaining the height in prayer and meditation and there can be no real fulfillment without it. To us training to music is what grammar is to English." It has been a journey of awards and recognitions for her. She did the city proud by winning the Zee Antakshri competition at the finals in Mumbai when Annu kapoor was the anchor. She has been awarded a Samman Patra by the Punjab Government for her role in the development of music, an award by Citizen Council Ludhiana and a gold medal by the Malwa Sabhyacharak Mela and recently the Usha Mangeshkar award by the Dhan Pothohar Brotherhood. Though Neelam sings all types of ghazals and has got a repertoire of over seven hundred songs, Punjabi folk is close to her heart. So the first album she cut was O Sohenya Pardesi. As she puts it "I wanted to give the people a taste of the real Punjabi music. It has a charm of its own." Commenting on today's pop Punjabi music, she says, "Believe me, it must be hard to produce numbers where you are supposed to dance also to woo the audience. I was lucky that I sang for myself as a bhakti and in the process pleased others." 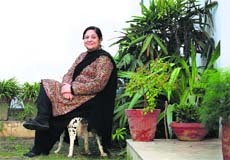 Her first album was followed by a collection of eight ghazals titled Chahat and the most recent was Virse Dian Yaadan. With so many accolades behind her, charming Neelam is now busy with her riyaz. When something is unusual in the garden, it makes all the difference. This unusual factor can be introduced with imagination and it can be anything ranging from growing an unusual plant to making an unusual feature that attracts one's attention. After every few days one finds a new product in the market. But at the same time it costs too. Some gardeners are very innovative. They use the old planting material in an innovative way to give a look to the garden. Let's, for example, talk about growing a hedge. Normally in gardens, you find clerodendron, duranta, aliar, murraya, hibiscus etc used as hedges. But the gardeners are now diverting from the tradition. They are using climbers to replace hedges. This kind of use ensures minimum maintenance planning besides getting a bonus of bounty of blooms. There are others who are using tree species to grow as hedge. See the accompanying picture. The tree species used is casurina. The needle like foliage makes for a good hedge when clipped. 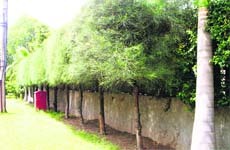 The advantage with this type of hedge is that it can be created at any height, even at 10 to 12 feet height. Such hedges come very handy in the areas where there are lines of houses at cross with each other. The gardens are visible to those living at the first and second floor of houses at cross. At such locations, high hedges are needed. Some gardeners even use Ashok (pendula) that grows straight up but in that case the tree being weak stemmed bends dangerously on one side. It is because of this reason that it has to be headed back at a certain height each year. One has to be imaginative and innovative while making a garden. It is very difficult for a gardener to light-up a shaded corner. 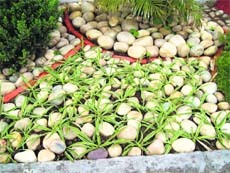 The gardeners use pebbles or stones making different designs to decorate such areas. But the process is mostly rejected by those who shun the use of concrete in the garden. But there is a compromise too. See the accompanying picture where white river stone has been used but the hardness of the stones has been softened by the use of spider plant. Other kind of grasses can also be used. If you find at any stage that the stone is getting hidden by the plants, these could be thinned. Steal the show this season with Colorbar's all new Glitterati palette specially dedicated to dazzle your nails this festive season. 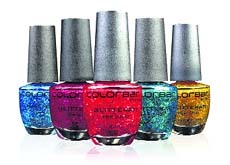 The shimmery palette of vibrant and trendy options promises nails that will shine like colourful jewels wherever you go. Colorbar Glitterati is filled with colourful big chunks and small chunks of glitter and adds a beautiful depth to your nails when used as a top coat over your favourite nail colour. For a subtle jewelled effect, you may also apply directly to bare nails and for that extra sparkle, top up with more coats and let your nails do the dazzle-talking. This innovative glitter formula comes with a double-flat brush for easy one stroke application thus providing full coverage. The formula is also formaldehyde free, toluene free, DBP free and does not cause yellowing of nails or chipping. Actress Swati Kapoor, who first acted in Kaali Eak Agni Pariksha, is all set to foray into Bollywood. She has signed an adult comedy and also a Punjabi film. She tells us more. What made you accept the adult comedy and how did you get the film? Acting happened by chance. I started it as a part time thing to earn some extra pocket money but slowly I realised that I enjoyed doing it, so I opted it as a career choice and took it seriously. From television to movies, how has been the experience over the years? My first big break on television was Kaali Ek Agni Pariksha, which was aired on Star Plus and from there my journey started. The experience till now has been quite a learning one as I never did any professional course in acting. Whatever I learned on the sets and after, sometime I decided to try for movies. I have completed the shoot of two movies, one is Hindi film titled FUDDU, which is a comedy film and the other is Punjabi film. You have also bagged a Punjabi film. Tell us about it? Yes, I bagged a Punjabi film and I have completed the shoot. It is tentatively named Mr. and Mrs. 420 and is expected to release in March. It is a comedy film with a good star cast and was entirely shot in Punjab. I am opposite Yuvraj Hans and I will be dubbing for the film soon. The whole experience has been good. What is happening on TV front? Doing a daily soap is very engaging and you don't get time to pursue any other projects. So, as of now I am concentrating on movies. As of now I am waiting for the release of both my films. I am having my fingers crossed and hoping for the best. Actress Soha Ali Khan and her actor beau Kunal Khemu get jealous when they see either of them romancing with another actor on screen. "Watching someone you like romancing (with) another person on screen is never fun. I do get jealous but I don't show it and even Kunal gets jealous when I romance another actor," Soha said. Kunal and Soha have been dating for quite some time and rumour mills are abuzz about their marriage. Soha feels that dating an actor comes with many difficulties. "The difficult part is to manage mood swings and each other's schedules. It is not necessary that both of us can holiday at the same time as we work on different projects, so our schedules are different," she said. Soha also spoke about the mood swings and other quirks of actors. "Everyone in today's generation is a narcissist and moreover an actor has a license to do just that and be temperamental, slam doors and break vases etc... We also do that. When I am being the diva then Kunal can't behave like a king. There are times when I am in good mood but he is not because his film hasn't done well or for some other reason and vice versa," she said. Kunal is doing a cameo in Soha's film Joe B Carvalho, releasing on Friday. The film stars Arshad Warsi, Soha, Javed Jaffrey among others. "He (Kunal) comes towards the end of the film. It is just a blink-and-you-miss kind of role but I hope he gets noticed. Nawazuddin Siddiqui has turned to film production with a 35-minute film. It is to be directed by the versatile actor's brother Shamasuddin Siddiqui and shot in Uttar Pradesh where they hail from. The yet untitled film highlights the condition women face when they cannot arrive at any decision. Nawaz said, "It was my concept and we shot it in my native place. It will go in the festival circuit." The film features newcomer Manisha Marzara, who has been pitted against theatre actor Jaihind Kumar and several of Nawaz's village folk. Averred Manisha, who also features in the upcoming film Babuji Ek Ticket Bambai Ka, "It was an experience shooting in his village. Staying with his (Nawaz's) family was amazing specially his mother's warmth." Meanwhile, Shamasuddin is also to direct Ganna, Gehu Aur Gun that will supposedly star Nawazuddin. Actress-producer Dia Mirza is excited to resume the shooting for Bobby Jasoos. The 32-year-old's mother underwent an emergency heart surgery due to which the shooting of her production venture was postponed. "All our bags are packed! Onto schedule 2 of 'Bobby Jasoos' yippee! Can't believe by the end of the month principle photography will be done! (sic)" Dia tweeted Thursday. Bobby Jasoos is the second project under the banner, Born Free Entertainment, which she co-owns with Sahil Sangha. The film stars Vidya Balan in the lead role. Their first production was the 2011 film Love Breakups Zindagi. Hollywood actresses Meryl Streep and Julia Roberts' new movie August: Osage County has been given a massive Oscars boost after picking up four awards at the Capri, Hollywood Film Festival in Italy. The movie adaptation of Tracy Letts' play about a dysfunctional family's reunion was named Film of the Year, while Streep picked up the Best Actress trophy and the cast won the Best Ensemble prize. Streep's co-star Chris Cooper also picked up the festival's Lifetime Achievement Award. Actor-filmmaker Farhan Akhtar took to microblogging website Twitter to wish his fans and friends on New Year. "Now that phone lines are not jammed and network not congested, even Twitter is back to its average update rate...I wish you a Happy 2014. Love," Farhan tweeted Thursday. 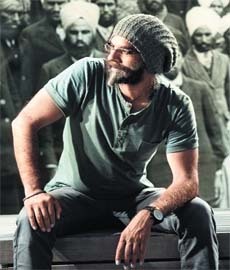 The actor was hugely appreciated for his character portrayal of Milkha Singh in Bhaag Milkha Bhaag. He will next be seen in Shaadi Ke Side Effects. Post the New Year celebrations, actor Uday Chopra feels it is time to come back in the real world again. The 40-year-old took to microblogging website Twitter and joked that since the festivities are over people can go back to "being mean". "Ok New Years over, everyone can go back to being mean now...I come to Twitter for the hate," Uday tweeted Thursday. 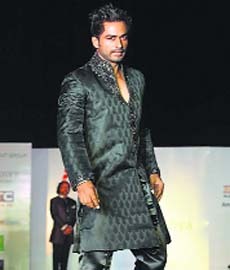 In his own funny way Uday also shared why hate is better. Britney Spears, who recently started her residency at Planet Hollywood in Las Vegas, paid a subtle homage to King of Pop Michael Jackson in the show. While performing Me Against The Music, the singer donned a fedora hat and struck poses resembling the Thriller hit maker's signature dance moves. You have seen her playing a submissive village girl, an obedient bahu and a malicious caretaker; now it's time for Jayshree Soni to step into a romantic comedy role on SAB TV's popular show Chidiya Ghar. And if the sources are to be believed, Jayshree has gone under a complete image makeover for her new character. Till now, Jayshree has been seen wearing Indian clothes on screen in all her shows. For the first time ever, the viewers will see Jayshree as a young and modern Bengali girl who loves to wear Western outfits. Jayshree's character Manchali, fondly known as Macchli, is a very chulbuli and outgoing girl. Jayshree's character Macchli will bring a new element of love and romance into the show as Kapi will be seen using various antics to woo Macchli all the time. The first release of January 2014 — Arshad Warsi-Soha Ali Khan starrer Mr Joe B. Carvalho is a fun-filled, detective comedy. Although Soha plays a bumbling cop in this comedy of errors, she will be seen wearing a bikini for the first time in a film, which also stars Geeta Basra, Javed Jaffery, Vijay Raaz, Karishma Kotak, Snehal Dabi, Shakti Kapoor, and Himani Shivpuri. Arshad plays a detective for the first time. Sholay Media Entertainment Pvt Ltd and Pen India Pvt Ltd in collaboration with Ketan Mehta's Maya Digital Studio brings back the 3D version of cult classic Sholay. And movie-goers all over are looking forward to experiencing the magic of 'Sholay' in 3D format. Sascha Sippy, grandson of late GP Sippy, has produced this 3D version and it took three years to convert it. New year means new beginning and everyone wants to start afresh. This year, get ready for some good content and entertaining programmes on the small screen with shows that will set the bar higher. It was a surprise for one and all to know that following in her husband's footsteps, Jaya Bachchan too will be making an entry on TV. It will be interesting to see her starring in a family drama. The show is expected to air in mid-2014 on Sony. Amitabh Bachchan's name is enough, they say. And yes knowing that he's doing a fiction show means the content and the performances will be something to look forward to. With Anurag Kashyap at the helm, the bar sure is set higher. The show is expected to air in early 2014 on Sony. After a rocking Season 1, Anil Kapoor is gearing up for the next season of 24. With multiple celebrities and talented actors, the Season 2 will surely be better than before. The show is expected to air in mid-2014 on Colors. His character Gutthi was a huge hit and its no shocker that Sunil will soon launch his own show, after leaving Comedy Nights with Kapil. With heavy competition from Kapil, let's see how he tickles our funny bone. The show is expected to air in early 2014 on Star Plus. A very positive and gainful period runs till the end of 2014. You will find excellent progress at work. Work hard and make the most of this time now. It is a period of progress and gains. All efforts made now will bring in maximum growth for you. Finances will look up and you will also spend some great time with friends. Socially, it is a very nice period. Professional travel for new opportunities is in the offing. Long distance travel is also on the cards. Positive colours: Yellow, Cream, Purple, Red. Charity on birthday: Donate white eatables like bread to the needy or at a religious place today. You share your birthday with Gul Panag (January 3, 1979, Chandigarh), who is an actress and former beauty queen who has competed in the Miss Universe pageant. Her notable films are Dhoop, Dor and Manorama Six Feet Under. She has combination of double 3 in her date, which shows a good career in the celluloid world in the coming years.